Over the past decade, I have used several password management applications such as Password Safe, KeePass and LastPass. Out of these products, only LastPass is cloud based. I have been hesitate to use LastPass over the last few years and stayed with KeePass because of the LastPass data breach back in 2015. Few months ago, my friend Alex Verkinderen finally convinced me to start using LastPass again. But this time, in order to be more secure and being able to use Multi-Factor Authentication (MFA), I have purchased a premium account and also purchased a YubiKey Neo for MFA. I understand not everyone is willing to spend money on password repository solutions (in my case, USD $12 per year for the LastPass Premium account and USD $50 + shipping for a Yubikey Neo from Amazon). Also, based on my personal experience, there are still many organisations that don’t have a centralised password repositories. Many engineers and consultants I have met still store passwords in clear text. On the other hand, Azure Key Vault has drawn a lot of attention since it was released and it is become really popular. I have certainly used it a lot over the last few months and managed to integrate it with many solutions that I have built. Once it is installed, you can launch the app either using the full name Invoke-AzureKeyVaultPasswordRepository, or use one of the 2 shorter aliases (ipr and Start-PasswordRepo). 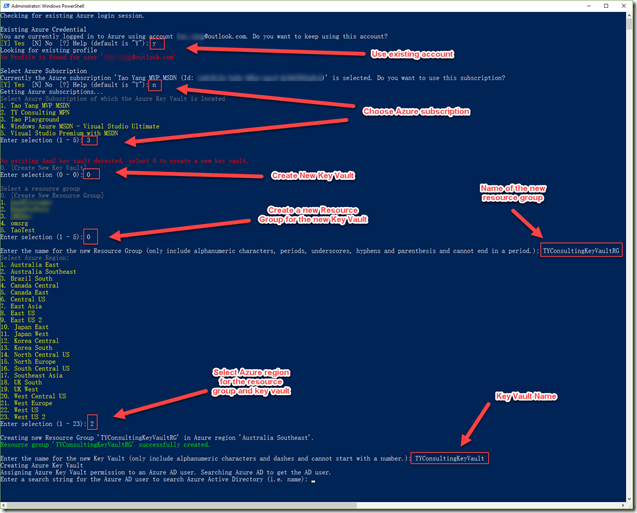 This module requires AzureRm.Profile, AzureRm.Resources and AzureRm.KeyVault modules, which you can also find from the PowerShell Gallery. When it is launched, it will detect if you are currently Signed in to Azure and ask you if you want to keep using the same account if you are currently signed in. you have the option to keep using the current account or sign in to Azure using another account. Then the app will prompt you to use the current Azure subscription that’s set in the context, or select another subscription from the list. 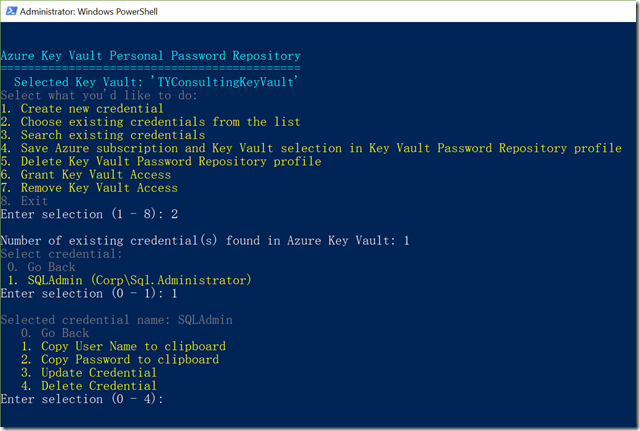 Once the key vault is created, you will need to assign full access to an Azure AD account. This is done by searching Azure AD using a search string and select an user account from the search result list. Note: It is by design that this app does not use any existing key vaults that you may already have in your subscription. You have to create a new one. Any existing key vaults that are not created by this app will not appear on the list for you to choose. 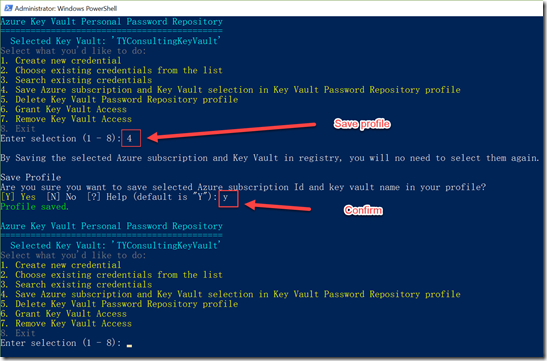 In order to make you access this key vault as fast as possible in the future, the first thing I’d suggest you to do is to select option 4 and save the Azure subscription Id and Key Vault name in your profile. this profile is stored in Windows Registry under HKEY_CURRENT_USER\SOFTWARE\TYConsulting\AzureKeyVaultPasswordRepo\Profiles\<your Azure account name>. Once the profile is saved, when you launch this app next time, it will automatically use the Azure subscription and the Key Vault that’s stored in the profile. 1. 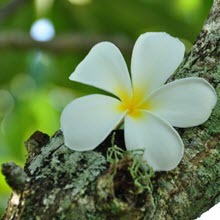 Create new credential (user name and password). you also have the option to generate random password by not entering a password. if you choose to use this app to generate a random password, the password will be copied to the computer’s clipboard once the credential is created (so you can use Ctrl-V to paste it to wherever you need to). Instead of selecting a credential to manage from the list, you can also search credentials (based on credential name) using option 3. 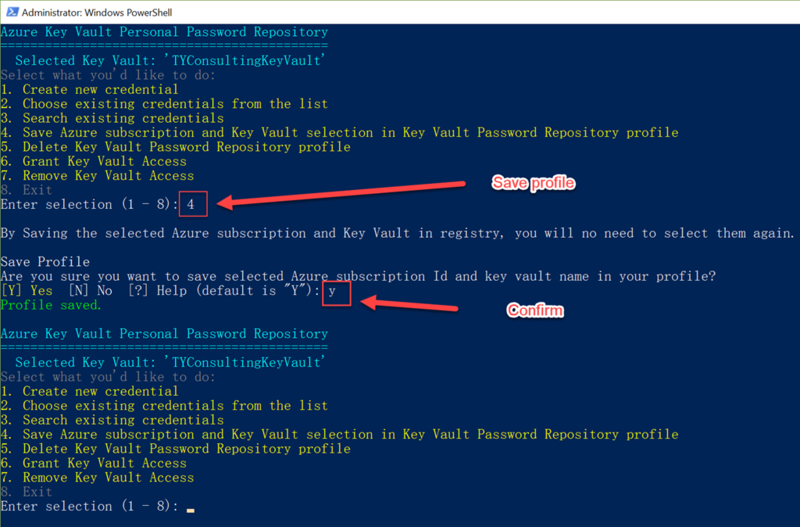 As shown previously, for faster access, you can use option 4 to store the Azure subscription Id and the Key Vault Name in the registry. if you decide to delete the profile (i.e. when you decide to use another subscription or key vault), you can use option 5 to delete the existing profile from registry. You can use option 6 to grant full access to the key vault to other Azure AD accounts, or use option 7 to remove access. Personally I’m pretty happy to see what I have produced during such a short period of time (only few hours based on some existing scripts I wrote few weeks ago). I think this would fill a gap for people and organisations that do not have a commercial password management solution. 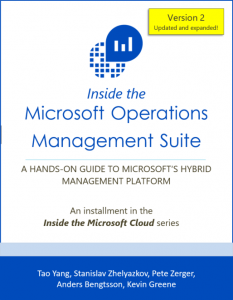 Azure Key Vault is a very in-expensive solution, and by using an Azure offering, you automatically inherit the MFA solutions that you have configured for Azure / Azure AD. i.e. I’m not using Azure AD premium for my lab but for my Microsoft (@outlook.com) account, I have enabled MFA using the Microsoft Authenticator app. Therefore in order to access the Key Vault using this module, I will need to use MFA during the sign in process. Lastly, please give it a try, and I’d like to hear back from the community. 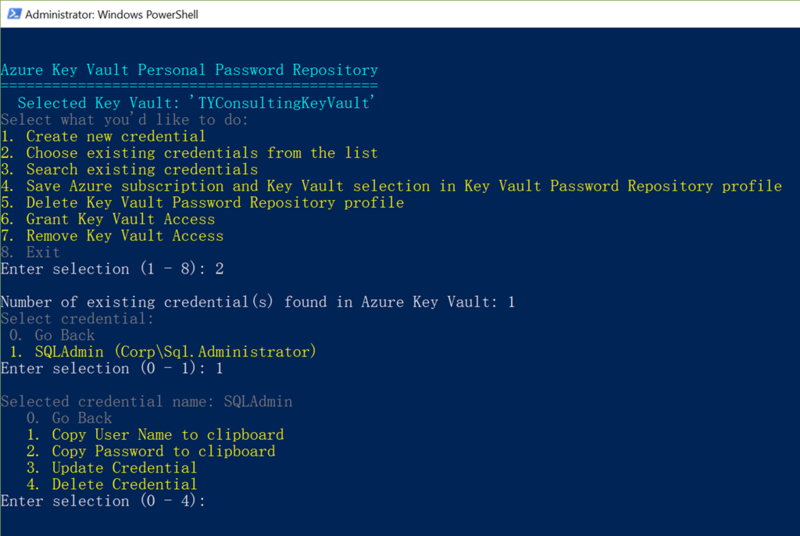 If you are interested to learn how to interact with Key Vault using PowerShell, feel free to read the source code of this module. if you have any questions or suggestions, please feel free to contact me! This is really great and I’ve been playing around with it a good bit. A process to import a large amount of passwords would be great. Manually entering 100+ accounts is labor intensive. Michael, thanks for the suggestion. but where do these 100+ creds are stored at the moment? how would you like to get them imported? Have you had a chance to look at a gui method yet? We have tried a web service with python. We can login to azure AD and preform most functions but don’t seem to have the ability to show the secret vaules! 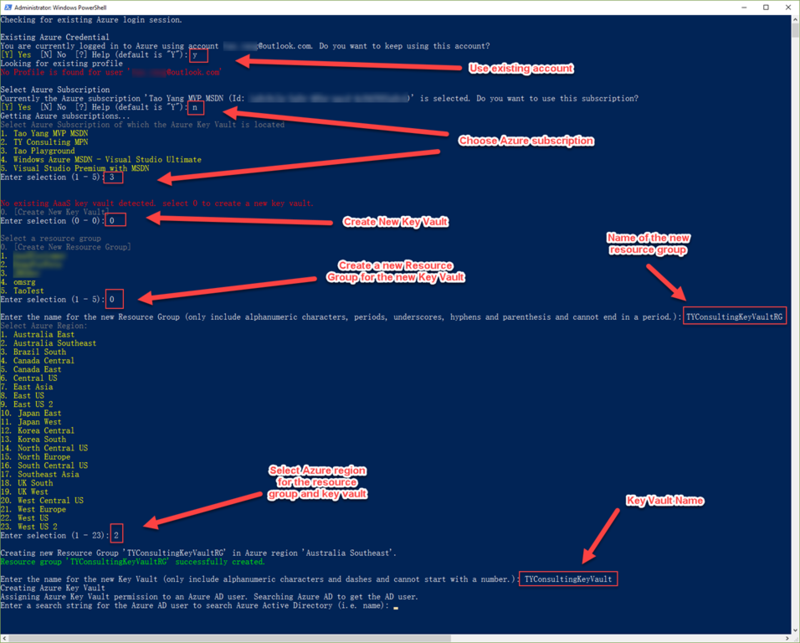 Apparently powershell creates a native ID or something where Azure AD login has a bug stopping the secret values being shown under a user.